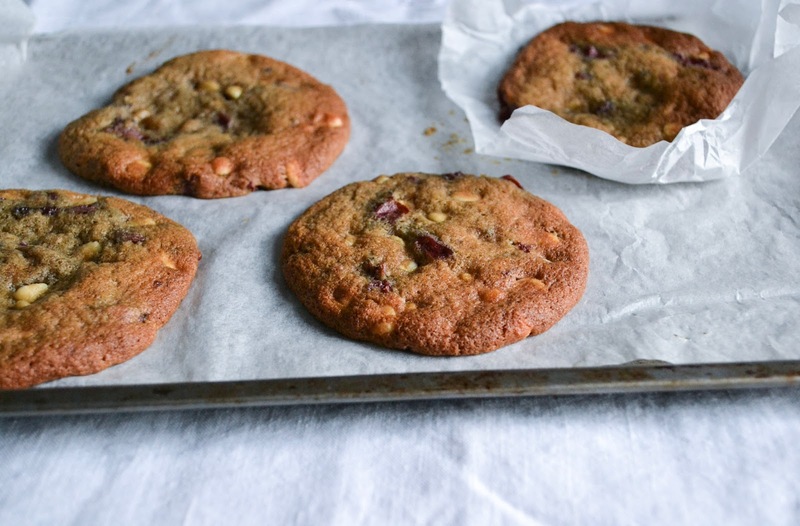 White Chocolate and Sour Cherry Cookies + a competition with Dr Oetker! Last week, Dr Oetker invited me to a decorating masterclass with the wonderful Juliet Sear to help launch WeBake.co.uk. I had so much fun learning from Juliet, who shared some of her favourite decorating techniques with us and was totally lovely too. For those of you who might not know, We Bake is a brand new online platform built specifically for home bakers. It's a little like Instagram, but is also packed with recipes, tips and advice from both Dr Oetker and the community of bakers. I've found so much inspiration from all the creative ideas that everyone is sharing. You can sign up for yourself here. 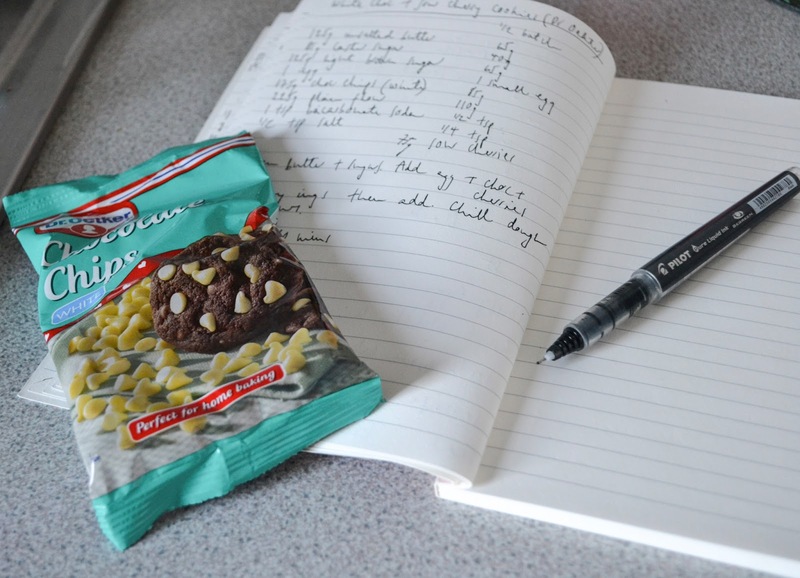 Dr Oetker, synonymous with sprinkles, essences and writing icing, sent us home weighed down with a whole plethora of goodies from their new product line to try at home. I have had a lovely few days closeted up in my kitchen and experimenting with glitter sprays, designer icings and Dr Oetker's chocolate range. And I'm excited to say that one of you lucky lot will be able to try the new product range out for yourself too! Dr Oetker have kindly given me a gorgeous hamper to giveaway on Pudding Lane. All you need to do is hop on over to We Bake, sign up and post a recipe or entry to one of the community competitions (why not Bake a Bauble or have a stab at winning the Cupcake Championship?). Just share a link to your post in the comments section below, and I'll enter you into the draw to win the hamper. What are you waiting for guys? 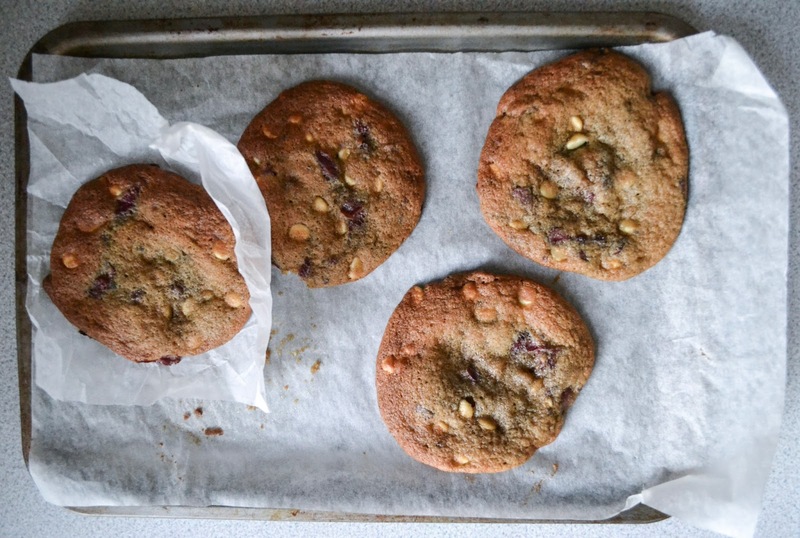 I tested this recipe using Dr Oetker's white chocolate chips, which are specifically developed so that they chunks don't melt, but maintain their shape when baking. The sweetness of the chocolate is the perfect match to zingy sour cherries. Line two baking trays with parchment, and ensure that all of your ingredients are at room temperature before you begin. Cream together the butter and sugars in a large bowl. Once smooth, mix in the egg. In a separate bowl, whisk together the flour, bicarbonate of soda and sea salt. Add the dry ingredients to the wet, and mix until just combined. Stir through the white chocolate chips. Dry and dice the cherries, then add these to the cookie dough too. Use an ice cream scoop to scoop 8-10 cookies onto the trays, then refrigerate for an hour. Heat the oven to 170°C / 150°C fan. 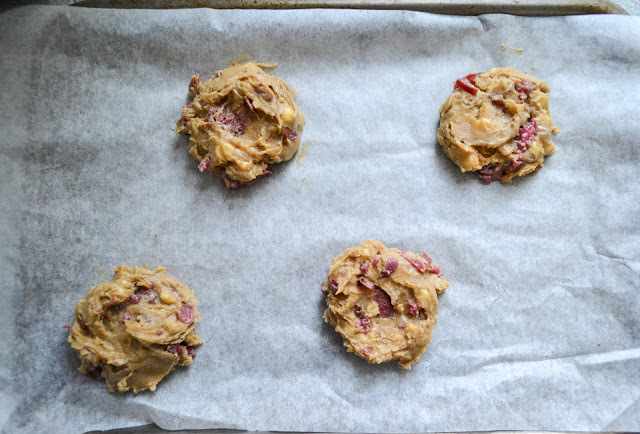 Bake the cookies for 8-10 minutes, or until they are golden and just cooked in the centre. Cool for 10 minutes on the baking trays, then transfer to a wire rack to cool completely.